The Sons Of Liberty - Bradlee Dean: Will We Americans Stand Down- Or Stand Up? 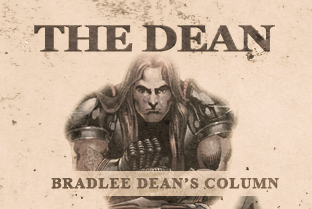 Home - The Dean-Bradlee Dean: Will We Americans Stand Down- Or Stand Up? – Inscribed on the bottom of one of the two statues in front of the National Archives building in Washington, D.C.
Just this last week I have traveled through 15 states: Minnesota, Wisconsin, Illinois, Indiana, Ohio, Pennsylvania, Massachusetts, Rhode Island, Connecticut, New Jersey, Delaware, Maryland, Virginia, and North and South Carolina, reaching out to high school and college students in hopes of finding those who will take the baton our forefathers have given to us. All in hopes of those students forging ahead a future for themselves and their posterity. Yet, how are they to forge ahead if they themselves do not know what America’s “His-story” has to reveal to them? In my endeavors, I found that what I thought I knew was only the tip of the iceberg in a plethora of information still left undiscovered; that is, as to whom we are as Americans. Every American should take the time to see what our enemies within attack. This is where they expose themselves and reveal what it is that they fear the most. If you are tired of the rhetorical sound of circular reasoning (bringing about no resolve) and defeatism and would like to see resolve brought to your country, then simply “study the past.” Then and only then can you stand with your feet fixed firm upon the rock (Matthew 16:18) of knowledge and understanding (Hosea 4:6). I know that there are skeptics out there that could be transported to the sun and still deny its existence, but the good news is, I’m only going to reveal to you some of America’s landmarks, which, in some cases, are literally in your backyard. ¥ Arlington Cemetery: Christian crosses above the heads of America’s fallen soldiers. Lastly, the Matrix of Liberty, or “The Monument to the Forefathers,” is a very short distance (blocks) away from Plymouth Rock and the replica of the Mayflower. This is, of course, the location where the Pilgrims landed after seeking civil and religious liberty. Unfortunately, this monument is overlooked and is virtually hidden. The Monument to the Forefathers is undoubtedly the most precious hidden relic of America. It is also believed that this monument was to be one precedent for the Statue of Liberty. This monument is so blatantly biblical, its presence so overwhelming, with a message so heart-wrenching, that anyone questioning God’s hand in the building of our great nation could be considered a lunatic. Clearly, the recipe for American liberty is written on this monument for all to see (Joshua 4:6-7). Next, MORALITY is a woman holding a tablet of the Ten Commandments in her left hand and the scroll of Revelation in her right. On one side of the throne is the Prophet Moses holding the tablets of the Law and looking toward heaven; and on the other side is an evangelist writing in a book. EDUCATION is a draped woman pointing to a book in her lap. The small figures in the niches to the right and left of her chair represent Wisdom and Youth. LAW is portrayed as a draped male also holding a book. His chair is supported by Justice (a woman with scales and sword) and Mercy. Lastly, LIBERTY is a helmeted male, draped with a lion’s skin, cradling a sword in his right arm and holding a broken chain in his left. The figures in niches on the sides on his chair represent Peace (a woman holding a horn containing food and drink) and Tyranny (a king laid low). These are meant to symbolize peace resting under the protection of liberty, tyranny having been overthrown by its power. Friends, let us consider the final inscription. If we as a people are grateful to those who have labored and sacrificed through their sufferings for the civil and religious liberties that we have today, could we as a people stand down when we all know that we should stand up? You decide! Study the past so that you can clear the path to your future through labor, sacrifice and suffering. This will put your enemies within out of business!